World Bank Management has agreed to allocate funding to assist Sri Lanka prepare a project for further funding and technical assistance. Commenting on the initiative, Tourism Minister Milinda Moragoda who was in USA said the bank was very receptive to supporting Sri Lanka Tourism, in the efforts in enhancing the standards and the quality of operations through capacity development for SMEs and other tourism institutions and enterprises to ensure experience to visitors. The proposed assistance will leverage the expertise and resources of the private sector, wherever possible in Public Private Partnerships (PPPs), as well as, community based initiatives to empower local communities and small entrepreneurs. “Moreover, it is expected to address institutional and human resource capacity building needs of key government institutions connected with developing and promoting tourism for Sri Lanka. “In addition, the Bank interventions may also include developing appropriate policies, compliance and regulatory mechanisms, marketing and promotion strategies for positioning Sri Lanka’s tourism offerings appropriately in key global markets. The Minister said that the outcome of these efforts, which will build on the recent reforms undertaken by the sector, will make Sri Lanka Tourism to be a billion dollar industry in the next few years. It is one of the few industries, which has under gone significant restructuring in the recent past, amidst difficult socio-political circumstances. Accompanied by the Ambassador for Sri Lanka in the USA, Bernard Goonatilleke, Minister Moragoda met the Executive Board Director of the Bank - Kumar, South Asia Regional Vice President Praful Patel, Directors John Roome, Peter Harrold and Sector Manager, Finance and Private sector Development - Simon Bell. The Bank plans to launch a mission shortly to Sri Lanka to build on the on-going discussions between the Bank and SL Tourism officials. Hotel Developers (Lanka) PLC, the owning company of Hilton Colombo has embarked on an expansion and refurbishment programme for upgrading the guest rooms of hotel Hilton Colombo. The last refurbishment programme was carried out almost eight years ago and the company’s view is that through such refurbishment programmes the hotel’s image as one of the market leaders of the hospitality industry is further strengthened. The total funds to be invested under this programme is approximately Rs. 200 million (US$2 million). 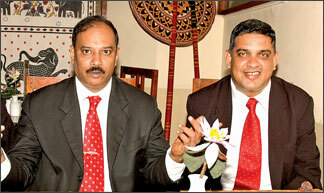 The majority shares (65 per cent) of Hotel Developers (Lanka) PLC is owned by the Government and held in the name of the Secretary to the Treasury. An agreement pertaining to the expansion and refurbishment programme between the Board of Investment and Hotel Developers (Lanka) PLC was signed by the Chairman of BOI, Dhammika Perera and the Chairman of Hotel Developers (Lanka) PLC, Nawaz Rajabdeen recently. Grand Oriental Hotel (GOH) one of the oldest hotels in Sri Lanka is to be upgraded to a three star hotel. The hotel managed by the Bank of Ceylon is now looking at building a swimming pool and having their own car park. Manager Security and Front Office of the hotel, Nalin Sirimane said they are also planning to launch a website to attract more UK travellers since the hotel was built by British in 1868. GOH with two suites, eight deluxe, four standard, 12 singles and 40 double rooms also boasts of Sri Lanka’s first Night Club Blue Leopard still operating in the basement of the hotel. He said hotel had undergone a major refurbishment recently and I now attracting many business travellers. He said they are now also looking at opening out their laundry to the public so that they could generate more revenue to the hotel. 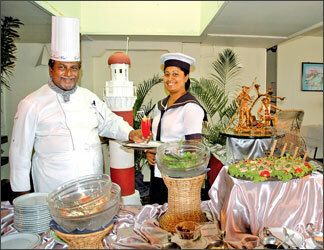 Food and Beverage Manager of GOH, Mohan Anthonypillai said their Sri Lankan buffet is very popular among executives. “Our main market is in the F and B sector,” he said. The colonial city hotel is also organising special family meal packages on Friday and Saturday nights at the picturesque harbour room overlooking the Colombo harbour. 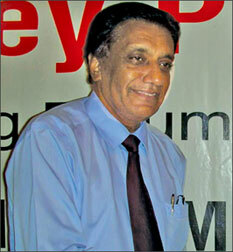 Anthonypillai was not in favour of the minimum room rate imposed for the City hotels. “Small hotels that do not fall in to this category are exploiting this rule. The rule should be imposed for hotels having over 100 rooms,” he suggested. For the fifth consecutive year, Sri Lanka Tourism was showcased at the prestigious Beijing Tourism Expo(BITE) - 2008 held at the Beijing Exhibition Centre from 19 to 21 June. With the sponsorship of Sri Lanka Tourism Promotion Bureau, Sri Lanka Embassy and Sri Lanka Airlines, Aitken Spence Travel, Jetwing Travel, Ceylon Tours, Walkers Tours, LSR and Lanka Holidays who are actively involved in the promotion of Sri Lanka in the Chinese market, participated at the Fair. Despite the difficulties facing in the Sri Lanka travel trade in the global market at present, a very positive response was received from Chinese buyers at the Expo to the satisfaction of the Sri Lankan participants which encouraged them with their efforts to penetrate the Chinese market, the world’s fastest growing travel market. The exhibition paved the way for Sri Lanka and Chinese travel sectors to interact with each other for better cooperation in future activities. The participants expressed their appreciation to the Sri Lanka Tourism Promotion Bureau and Sri Lanka Embassy for their continued efforts to capture this market. They agreed that time has come for the Sri Lankan travel companies to join the rest of the world to focus on new destinations like China. China being a huge territory and a competitive market, more investment and focus is needed to get a visible impact. By 2015, China is expected to become the largest outbound tour market in the world. Last year alone, there were 47 million outbound visitors from China towards approved destinations all over the world. BITE, which is fully sponsored by Beijing Municipal Tourism Bureau jointly with China National Tourism Administration, is the biggest annual travel fair in Beijing. This year, around 80 countries participated with more than 1,000 hosted buyers and thousands of Chinese people. Performances of ‘Channa-Upuli Performing Art Foundation’ at the Sri Lanka pavilion during the three day period attracted large number of Chinese visitors and media. Sri Lanka pavilion which depicted the national heritages and the beauty of country was selected as one of the most outstanding booths presented.